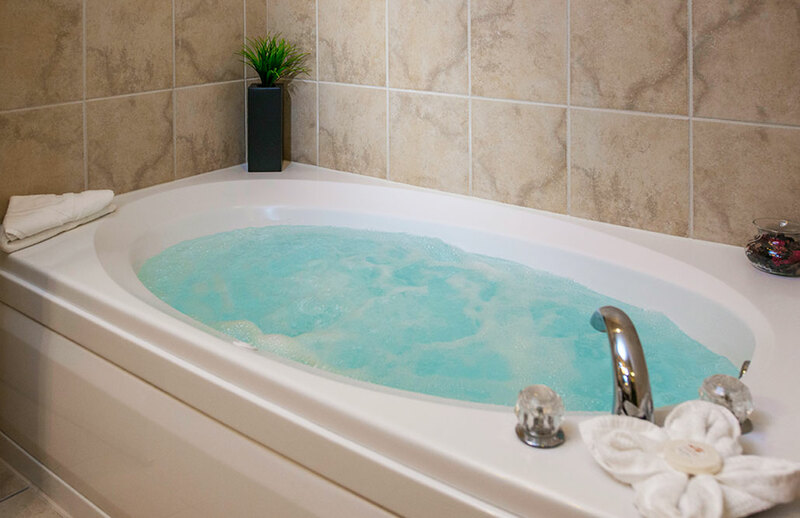 Providing you with a wonderful vacation experience isn’t just an aspiration; it’s our obligation. 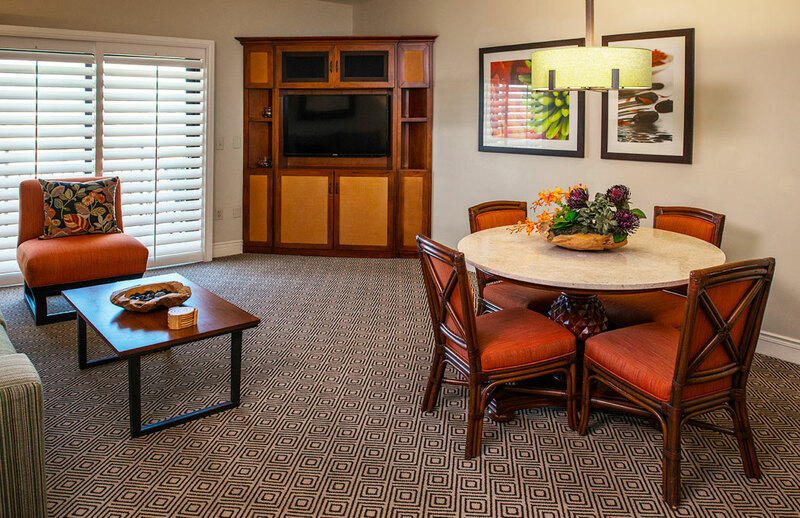 We know your complete satisfaction hinges on many factors, not the least of which is a guest suite that offers all the comforts of home and quality that can be seen and felt. 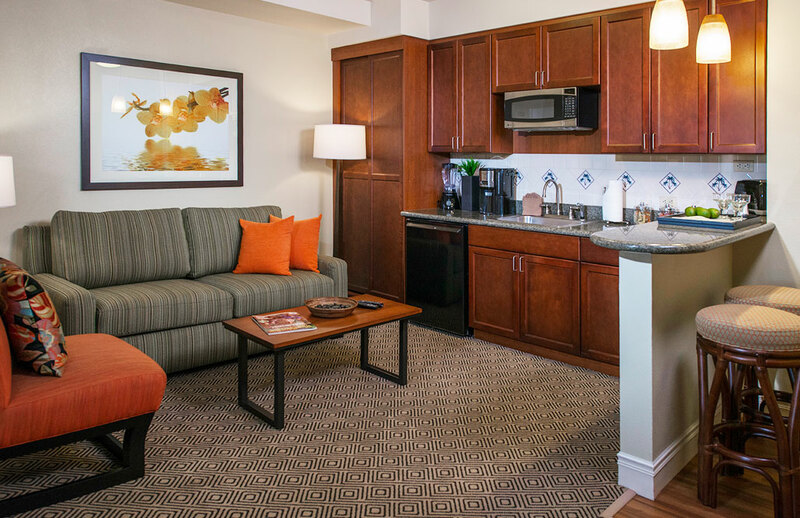 That means more than just ample space and convenient amenities. It also requires a commitment to taking out the old and bringing in the new. 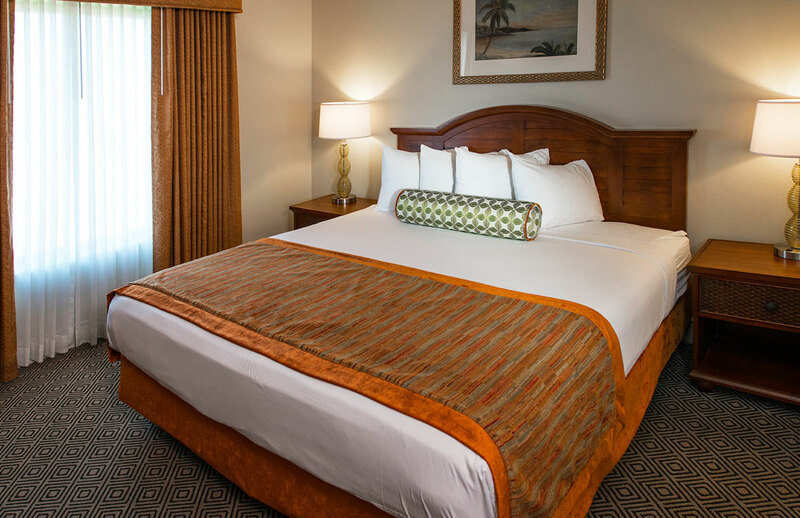 Our $6.2 million room renovation, a two-phase project implemented in 2015 and spearheaded by interior designer Ron Nicola, reflects that commitment and has resulted in a fresh new look for all our 876 guest units. You’re sure to get a great night’s sleep on our new American Leather queen sofa sleepers with premium comfort mattresses. 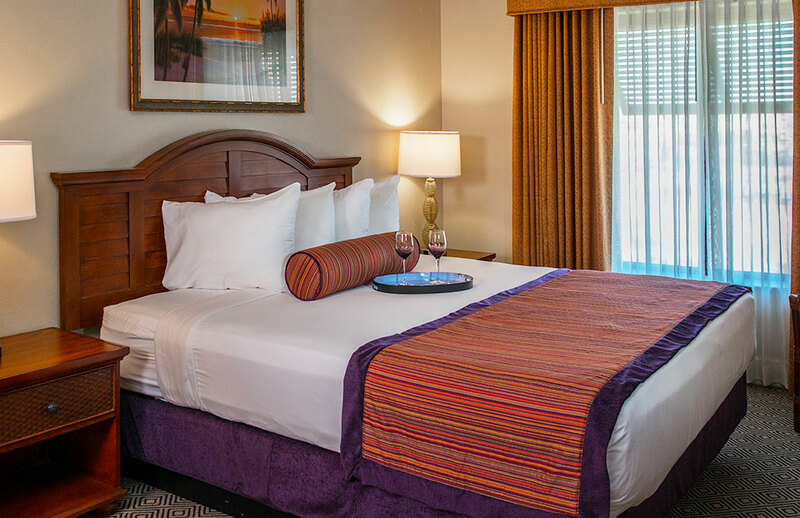 Sweet dreams dreaming of drinks by the pool and languid laps around the lazy river. Our attractive loop carpet from Signature Hospitality scores high marks for looks and durability. On a scale of 1 to 5, it receives a 5.0 on the Hexapod test, which evaluates appearance retention after simulated foot traffic. Our new Tandus-Centiva wood-style vinyl flooring is soft to stand on and warmer to the touch than other hard surfaces. You’ll love being barefoot in the kitchen. Attractive and sturdy, our new brushed aluminum table and chair set from Woodard will be calling you to the balcony to savor the view. 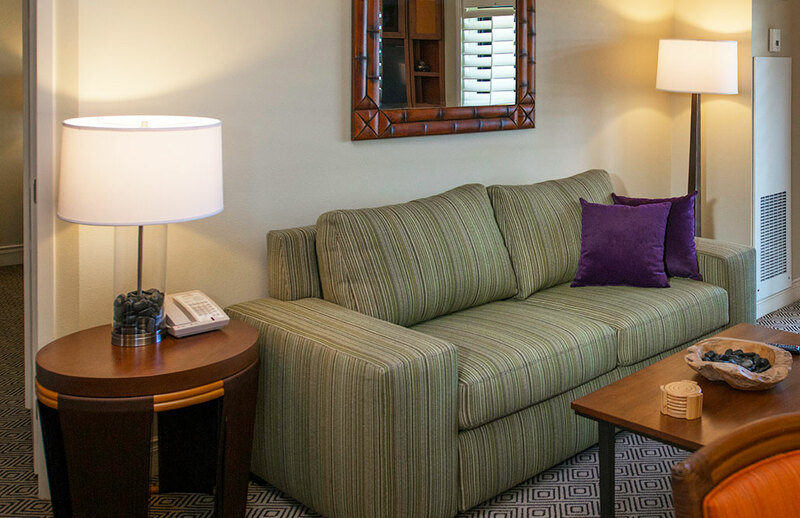 The attractive modern design of the coffee and end tables, made especially for Tahiti Village by Interior Fashions, is notable for minimalist clean lines and earth tones that complement our Tahitian theme. One has a glowing green base of blown sculpted glass. The other contains polished river rocks inside a clear cylinder. Both of these table lamps from Better Designed Lighting are so refreshingly different you’ll wonder how they’d look in your own home. Hey, don’t get any bright ideas! Better Designed Lighting’s tall floor lamp makes for an ideal dancing partner. Go ahead – tango! Colorfully covered and amply padded, our new armless chair (another Interior Fashions masterpiece) is stylish and comfortable. Just don’t get too comfortable – you could easily slip off the side. Pile on the plates! Our new stone tabletop can take anything you dish out. A link chain with an attractive brushed nickel finish suspends our new dining room lamp from Better Designed Lighting over the granite tabletop. It may not help you see what you’re eating any better than its predecessor, but with an attractive linen shade to divert your attention, you may not notice anyway. With a new bolster pillow, throw and box spring glove from Pacific Hospitality Design, why mess up a bed so nicely made? Just call it a night on the comfortable queen sofa sleeper in the living room. These invaluable tools from Jerdon are invaluable in preventing the misapplication of lipstick and eye shadow. It’s really interesting. Just don’t ask us what it means. 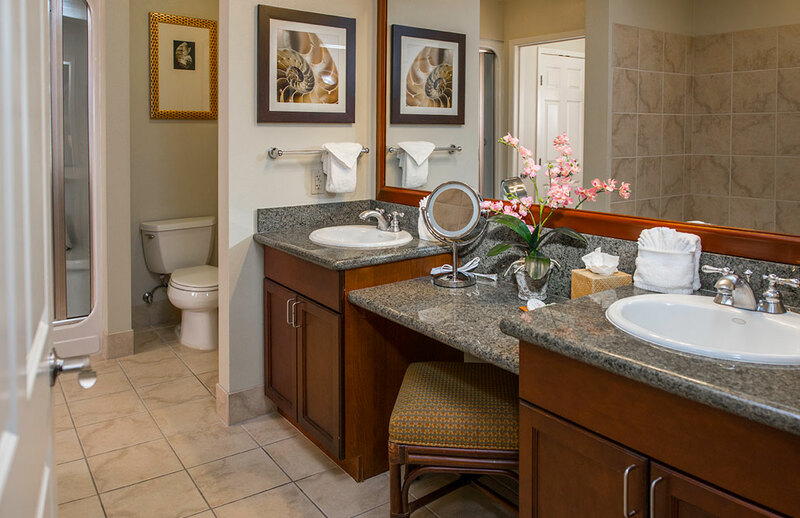 We’ve heard the bathroom prints described as “Art Nautique” for their nautilus images and the living room photos as “stones, flowers and water” for their abundance of stones, flowers and water. Sure, why not?